HOMÚN, Yuc. 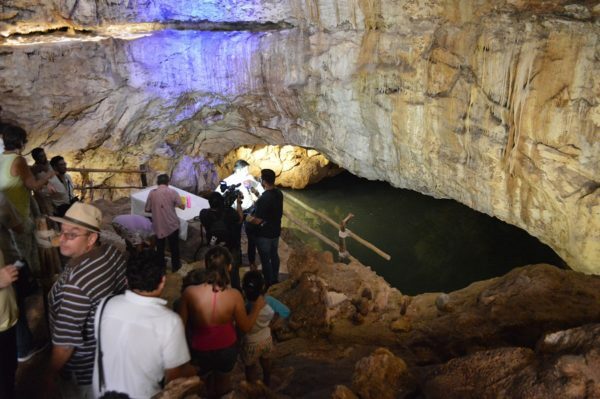 — Thanks to the effort provided by specialists, civil associations and Homún citizens, who worked more than eight months to give life to this project, Yucatán has just implemented a new cenote-circuit to serve both national and international visitors. Homún is located about 50 kilometers from Mérida, and people can get there by car, through the Cancun highway and then exiting towards the town of Acanceh. The new circuit is made up of seven cenotes (sinkholes) which have already undergone a process of cleaning, reforestation and infrastructure adaptation. People can access all these cenotes through a circuit of sac-bés (white paths), that allows one to enter sites located amid hills and low jungles. During the inauguration, Underwater Archaeologist Sergio Grossjean Abimerhi, said that he and his diver team were in charge of cleaning these cenotes. Likewise, he acknowledged all the work and effort that resulted from this new alternative of sustainable economic development. Simultaneously, he requested inhabitants and visitors to respect “these natural treasures”. “During eight ardous and challenging months, combined with intense work, this cenote-circuit project finally became real. Not only did we have a special team and sponsors supporting us, but also many of the residents came to help us.” he stated. Besides the cenotes from the circuit, national and international visitors will be also able to admire the beauty and marvelous scenery from waterholes such as “Chelpak”, “Balmi”, “Hool Cozón”, “Chulul” and “Canunchén”.